The 6ft x 8ft Cedar Greenhouse is part of the Essentials Range by Gabriel Ash and is the most popular size with our customers, made to an exceptionally high standard using quality materials but still at affordable prices. 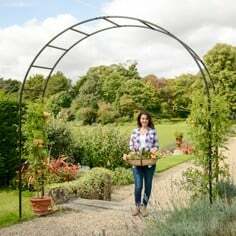 The Essentials Range of Cedar Greenhouses by Gabriel Ash are the ideal choice for country gardens, cottage gardens and traditional settings where the wood blends easily and naturally within a garden and looks in keeping with the natural environment. 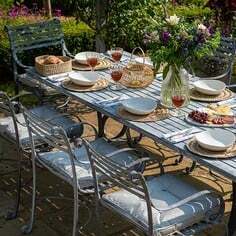 It can become a focal point too by positioning in a prominent place that is central to a whole garden design. Expertly designed and manufactured in the UK by long established, highly skilled engineers, these superb cedar greenhouses have many benefits along with a 10 YEAR STRUCTURAL GUARANTEE. 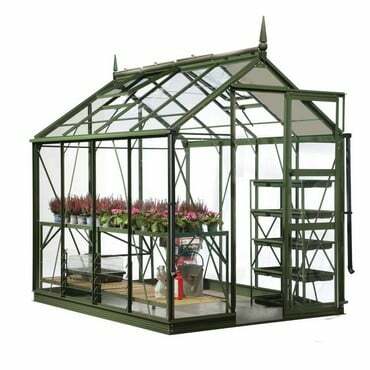 The 6ft x 8ft Greenhouse is suitable for propagation, growing summer salads or over wintering your precious potted plants. 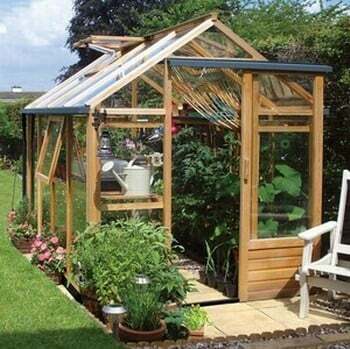 All Greenhouses are supplied with a base cut to exact size as the greenhouse. Western Red Cedar is a top building material that withstands adverse conditions and provides enhanced weather resistance. It is naturally durable, producing long lengths of timber that benefits from a true, strong and straight grain. Free from pitch and an being an oily wood, it is naturally rot resistant to decay by pests and fungi and is much less needy in terms of regular maintenance compared to other softwoods. Untreated, Western Red Cedar weathers to a beautiful silvery grey colour, reminiscent of sun-bleached driftwood, but if you want to preserve its rich colour it will need treating from time to time. Excellent heat retention qualities, a real benefit for the winter and for reducing heating costs. As the framework breathes and does not conduct heat it will stay cooler in the hot summer months too, thereby maintaining a constant temperature for a healthier growing environment. There is also reduced condensation within the greenhouse. 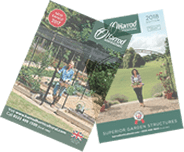 A wooden greenhouse frame makes setting up secure, permanent and temporary plant supports quicker as you can screw into the wood in any position to suit the growth of your plants. 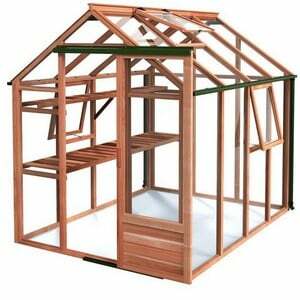 Very easy to attach greenhouse shelves, wooden staging and even hooks and racks to the wooden greenhouse frame. This is a particular advantage during the winter when an insulating layer of bubble wrap can be quickly attached to the inside of your cedar greenhouse to protect your plants from extreme cold - see How to Insulate Your Greenhouse. No internal supports ensure clean lines whilst the high eaves and ridge maximise internal space. 2 side vents and 2 roof vents included. High capacity gutters and downpipes included. 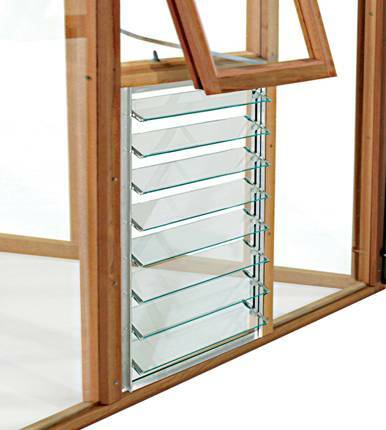 Toughened safety glass to BS6206 standard that secures in place with capping - no clips. Engineered wide sliding door on aluminium runner with roller bearings. The fixings and fittings complement the natural preservatives present in the wood and are made from corrosion resistant, high grade stainless steel. Supplied in a flat packed self-assembly design. All timber is PEFC certified. Greenhouses should be installed either on our easy to install steel base (included) or a concrete plinth. 8ft Greenhouse Staging - create a useful work top area positioned at waist height for ease of use. 8ft Shelving - High level shelving for invaluable additional space. 8ft Blinds available separately - perfect to control the amount of sunlight in the greenhouse. Additional Vent Openers and Louvre Vents are available separately. Delivery is usually within 28 days. Please note there is a delivery surcharge to some remote parts of Scotland, Isle of Man, Isle of Wight, Offshore Islands and Northern Ireland please call 0333 400 6400 for a carriage quote. Unfortunately we are unable to offer an installation service on this product. There is a list of approved installers available on request which can be contacted directly and is also supplied in the installation manual. 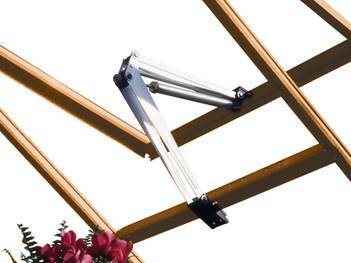 These steel bases are supplied with each size of greenhouse. 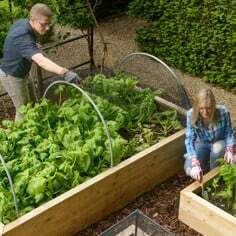 They are cut to the exact size of the greenhouse so will help in deciding where to situate the greenhouse, and take away the need for a solid footing around the whole perimeter of the structure. 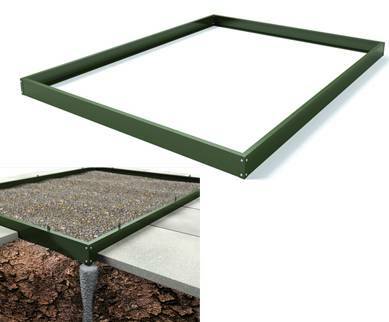 Using the Growhouse base ensures that the surface you are fixing the greenhouse to is flat, and lifts the greenhouse off the ground to protect the sill from any water build-up that may penetrate the wood and reduce its lifespan. 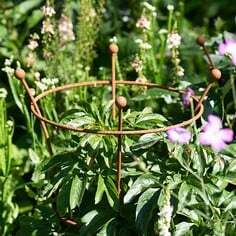 The base is easy to put together, and even easier to affix down to the ground. The sturdy bench staging creates a useful worktop area with handy storage space below. 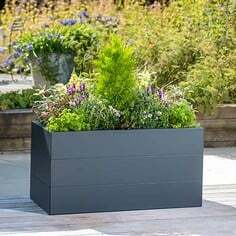 Positioned at waist height for ease of use and to give sufficient growing space for any plants on top of the staging. 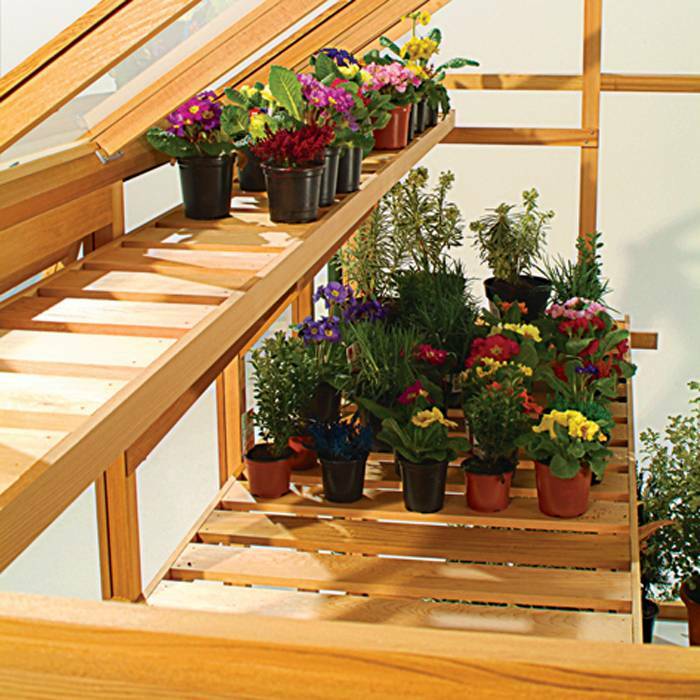 The high level shelving gives invaluable additional storage space, perfect for starting off seedlings and general storage for seed packets, gardening tools, gloves and reference books. The blinds have been designed to easily fit the greenhouse allowing you to control the amount of sunlight in the greenhouse. The blinds reduce the amount of summer sunlight which can aid plant growth and prevent scorching and plant burn. The Louvre Vent has been designed to fit into the panel below the side opening vent in the greenhouse. When open this creates excellent additional lower ventilation in the greenhouse. These cleverly designed vents open and close automatically with no power needed. Operated by a wax filled cylinder that expands and contracts as temperatures rise and fall automatically opening and closing the window. Q. What sort of base do I need? A. We recommend that your Gabriel Ash greenhouse is erected onto a solid strip foundation, plinth, slab or dwarf wall. 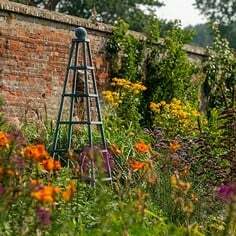 Our Essentials range can also be mounted onto a concrete plinth however we highly recommend you opt for a steel base accessory for ease of installation. A base plan for your structure will be issued when you place your order. Q. Can I ask for safety glass to be fitted as an optional extra? A. Safety glass to BS. 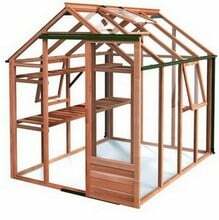 6206 is fitted as standard to all Gabriel Ash Essential greenhouses. Q. 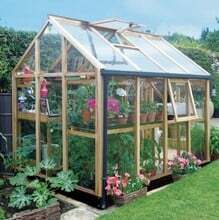 Can you fit double glazed units to a greenhouse? A. Greenhouses tend to get too hot with double glazed units so we do not offer this. Q. Can I have hinged opening doors instead of the sliding ones? A. Unfortunately, there is no option for a hinged door on the Essentials Range. Q. Do I need to treat the cedar greenhouse? A. Western Red Cedar contains its own natural preservatives, giving your greenhouse a long life span without the need for treatment. Cedar will mellow to a silvery grey over time; if you wish to prevent your greenhouse from greying and maintain or change its original colour there are several proprietary brands on the market that are suitable. Western Red Cedar absorbs stains and oils readily. Q. What is greenhouse staging and shelving? A. Greenhouse staging is the slatted cedar potting/work bench normally positioned at waist height. Shelving is the narrower slatted storage platform that is positioned above the greenhouse staging. Q. Do I have to assemble the greenhouse myself? A. All of the Essential Greenhouses are delivered on a supply only basis and are designed for easy self assembly. Q. Is delivery and VAT included in the price of the greenhouse? A. Delivery is usually within 28 days. Please note there is a delivery surcharge to some remote parts of Scotland, Isle of Man, Isle of Wight, Offshore Islands and Northern Ireland please call 0333 400 6400 for a carriage quote. Please note that deliveries of Coldframes is unfortunately only to ground floor level, so whilst living on the 10th floor won't stop you having one of our coldframes, you will need to meet us at the main ground floor entrance. VAT is included at the standard current rate. Q. Can rainwater from my greenhouse be diverted into water butts? A. 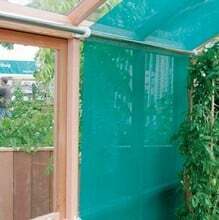 Yes, all Gabriel Ash greenhouses and glasshouses come complete with gutters and 1½" (40mm) down pipes; these standard aluminium pipes are easily adapted to fit water butts. Q. How can I provide shade in my Gabriel Ash greenhouse? A. We can supply greenhouse shading consisting of internal roller blinds in varying widths to complement your greenhouse. We also have Greenhouse Shade Netting available. Q. Planning Permission for a Greenhouse? The greenhouse should not be built forward of the front elevation of the house. The greenhouse should be single storey, with a maximum eaves height of 2.5m and maximum overall height of 4m with a dual pitchedroof, or 3m for a lean-to. The greenhouse should have a maximum height of 2.5m if it's within 2m of a boundary of the curtilage (area accompanying the property) of the house. The greenhouse should not cover more than half the area of land around the "original house" – this is the house as it stood in July 1948 (or when it was built if that is the latter date). It is worth bearing in mind that although you may not have extended, a previous owner may have. If your greenhouse is going on the side of the house within the above areas (AONB, National Park etc) Planning permission will be required. If your greenhouse doesn't fit one or any of the above criteria, it doesn't mean that you can't have it. 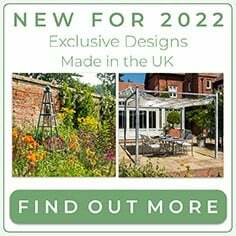 All it means is that you may require planning permission for the greenhouse to be installed. When it comes to planning, your new greenhouse is unfortunately no exception, and as always, if you think you need planning, the best course of action is to give your local council a quick call and ask! For those that are worried about building regulations, have no fear. Building regulations are only applicable for habitable buildings, or structures such as Summerhouses over 30m2.